A Moment of Eternity in the Passage of Time is a black-and-white video projection with images by visual artist Nicolas Kozakis and text by philosopher and writer Raoul Vaneigem. The work was shot in Mount Athos, a remote mountain and peninsula in northern Greece, which is home to a number of Greek Orthodox monasteries. Access to the area is restricted to few visitors and women are not allowed. Apart from being a holy place, it is also one of escape and meditation for those who manage to gain access. The video unfolds in an undisclosed location, by the sea. A sad-faced, lone immigrant construction worker goes about the task of building a traditional stone house, at his own pace, stopping now and then to smoke a cigarette and contemplate the magnificent, totally still sea view. 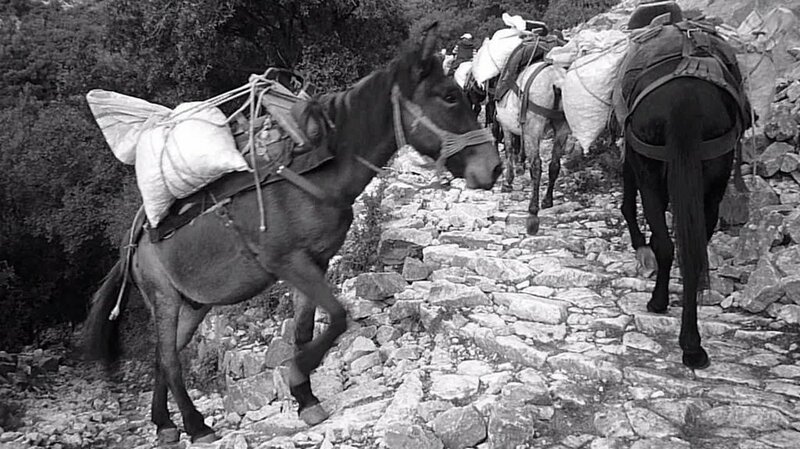 His task is facilitated by a few donkeys, ancient labourers which have now become all but obsolete from the modern workforce.